Hi everyone, this month I’m co-hosting a few blog hops thanks to an awesome giveaway that I won! 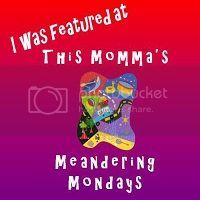 So first up is This Momma’s Meandering Mondays! Please link up and if you are at my blog for the first time from the hop, say hi in the comments! 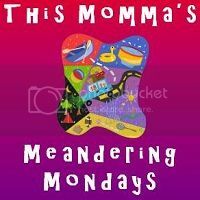 Welcome one and all to a brand new year, brand new friends, and brand new goals for This Momma’s Meandering Mondays #28! We are so excited to welcome back the many familiar faces who join up with us each week and we welcome all of the new faces that choose to join us each week. Your support has made This Momma’s Ramblings’ first year absolutely amazing! I cannot believe that I have officially been at this for one year, this month! So let’s start this 2014 out with a bang and link up, link up, link up! But before we start this party…Grab a badge! Say howdy to my linky party co-hosts… The wonderful Jessica from The Wondering Brain and Natasha from Epic Mommy Adventures. Newly joining us is… The very wonderful Lisa from Chronically Content! The very fabulous Dara from Not In Jersey! Grab a badge and join the party! Now it is time to introduce our favorite This Momma’s Meanderer’s from last week, and boy oh boy it was a difficult choice! Don’t forget to grab your “I Was Featured” badge of honor! Congratulations to you all! Natasha’s favorite came from Army Wife to Suburban Life with the post “A Few Things Worth Seeing,” saying, “This is a great post and so similar to my own thinking! It’s so true – when I first started blogging, I tried to copy what other, more successful bloggers were doing. When I found my own voice and my own style in blogging, I saw that I had more readers and they were more interested in my posts. And although I’m anxious to really start monetizing my blog, I want to focus on growing my blog and finding my niche first, then I believe that I will be more successful at monetizing. All around – a great post!” Millie and Kristina’s favorite came from Honesty’s Protege with the post “My Life Book 2014,” saying, “I think this is a great idea – it can help you set goals, see how you have grown and encourage your personal growth!” Mrs Tee’s favorite came from Pragmatic Mom with the post “Celebrating my Birthday with Random Acts of Kindness,” saying, “I feel that the thought of doing things for others on your birthday is one full of selflessness and definitely a large undertaking. I admired the uniqueness of the Acts as well as the willingness to complete the goal despite life’s delays (sickness).” Sinea’s favorite came from Kids Fun 101 with the post “Snowmen made from Kid Thumbprints make Perfect Holiday Thank You Cards,” saying, “I loved the snowman thumbprint craft.” Megan’s favorite came from Organizer By Day with the post “Oatmeal Raisin Chocolate Chip Cookies,” saying, “ I love the addition of chocolate chips to a traditional oatmeal raisin cookie. Yum!” And my fave came from Country Road Abode with the post “Fairy Gardens.” The hubby and I both fascinated by the thought of little fairy/elf gardens and doorways throughout our house. He has even talked about decorating one room in a medieval theme and include these types of things in the decor. Congratulations to all of you amazing and wonderful linkers! Don’t forget to grab and display our “Featured” badge! Thank you to all of you who joined us last week! Now let’s get this party started! Remember everyone enjoys a little comment love! Feel free to “meander” by some fellow bloggers and find a new recipe to make for the family, a helpful blogging tip, a funny story to read, and best of all a new friend to make! There are really no rules to follow, only some suggestions to keep in mind…because we are all to enjoy the friendships that come along by doing these few simple and wonderful things… 1. Link up your favorite post…a story, a recipe, a photo, or a helpful tip…As many as you want, that’s right as many as you want!!!! 2. Please follow our Host’s and Co-host’s 3. Find some new friends to follow, friendships are what it’s all about! 4. Be sure to leave some comment love, to get it in return. 5. Grab our badge and display on your blog, sharing the love is what it’s all about. Meander through the links and make some new friends, find some amazing and useful tips, and maybe even a new treat to try!